Natural Collection Pressed Powder in Warm has become the powder that I use every day. It's not necessarily the powder that I would use if I was doing someones make-up for a photo shoot or for their wedding but then I'm not getting married or having my photo taken every day. This powder is incredibly easy to apply, light and smooth. It doesn't leave patches or add colour, it takes shine off the face and is really invisible. It's £1.99, fragrance free and dermatologically tested I can't see what is not to like about this incredibly good value for money product. I usually have red nails in the winter and coral nails in the summer but I fancied a bit of a change this week so I tried out MyFace Lil'bling Nail Chrome in Black Ice. I don't really know what I was expecting - well I think it was a sort of 90's style silver - but what I got was dark, dark grey with fantastic metallic finish. Pretty easy to apply although you will certainly need two coats and it is hard to clean up the edges (as you will see from my terrible picture - I'm afraid Joe has gone off with my camera in his pocket so this is taken on my phone). For those who like a bit of understated nail drama I really recommend this. I am big believer in red being the most glamorous and smart of nail colours but for those who want grown-up, glam nails this is definitely worth a try. Only £5.99 and a great addition to your colour collection - I just love these nail colours more every time I try them. There are quite a few make-up books that I should probably be putting up here - they are either great for inspiration or for technical know-how but Facing Beauty: Painted Women and Cosmetic Art which I received for Christmas is the best book on beauty, it's history, what has been, and is, considered beautiful and what women have done to accentuate their image in the eyes of the world. 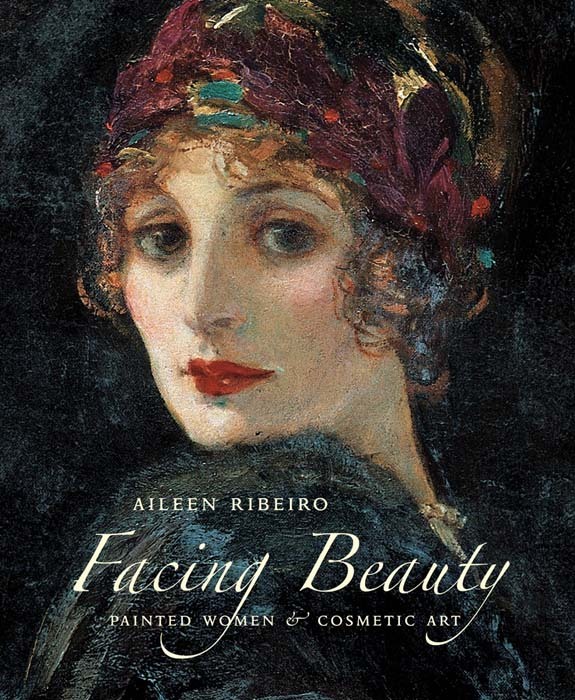 Professor Aileen Ribeiro focuses on the period between 1540 and the women in Renaissance paintings to 1940 where the cosmetics industry really started to influence how women were able to change and adapt they way they looked. Facing Beauty: Painted Women and Cosmetic Art is full of beautiful colour plates showing real and ideal women throughout history and the costumes, fashion and cosmetics that influenced them. DIY hair treatments are a necessity in these financially difficult times and Charles Worthington have come up with the Salon at Home range which includes a fantastic, affordable, solution to damaged hair. I've raved about Ojon products before now and although they do work and are environmentally ethical they are not exactly money saving so I've been on the hunt for something to help my damaged hair, at home, that isn't going to break the bank. Charles Worthington's Strength and Repair Hair Repair Kit is a three part treatment that you can use once a week and really does make a difference. It contains oils which penetrate the hair, smoothing it and making it less prone to damage. It's only available at Boots and is £19.99 - not so cheap you may be thinking but you get three treatments with this and as you only use it once a week it should last you some time. Sometimes, usually when I have a particularly nasty cold, I get a spot/crack in the corner of my mouth. I know I'm not the only one but, having looked into causes etc on the Internet, I seem to be the only one with a helpful cure. I did do research into what causes it and I'm not going to go into that here because, well... I didn't agree. Some people say it's a vitamin disorder, some say its an allergic reaction to some foods or products, some even say it's a form of herpes. I don't think it's any of these... well the one I get isn't. OK so if I eat a whole pineapple I may get one, I'm not denying that acidic foods may be a cause sometimes but mine is about once a year when I'm coldy. So if this sounds like something that happens to you and you've not found anything that works then - and I know this is going to sound weird - try using Zinc and Castor Oil cream from Boots (or in fact I've just found it cheaply here - although I haven't tried this particular one). 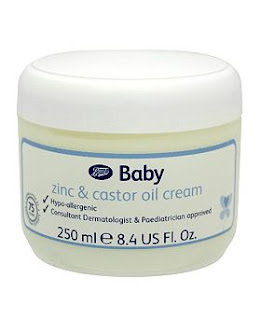 It's in the nappy rash section and no using Sudocrem is not going to be the same. This stuff really works if you apply it whenever you remember, for a couple of days. I'm just about getting over my Sleek makeup resentment that I won't go into here and do have quite a few of their eye shadow palettes - they are great for having a variety of colours and not breaking the bank and, although they do drop down quite a lot they are highly pigmented so you get a good colour payoff. I actually have about five at the moment but my new favourite is the Bad Girl i-divine palette - it has a fantastic variety of colours for doing smokey eyes - greys, greens, blues and black with two paler colours to use as a base. It's been around for a while but I originally (wrongly) thought it was a bit limited in the colour department and was mainly greys and blacks which seem to be everywhere and pretty easy to get hold of but I was wrong. The greens 'intoxicated' and 'envy' are my favourite. Good greens are hard to come by, let alone two that blend well together. £6.49 for 12 great, usable colours is great value for money. I really recommend checking these palettes out - they change them round quite often so if you want this one I'd get it asap. A couple of weeks ago I reviewed Colossal Volum' Express Mascara by Maybelline Cat Eyes and said I hated it... I used it a couple of days ago and, to quote the immortal words of Dr Houseman 'when I'm wrong I say I'm wrong'. Happy New Year. I hope you've all had a wonderful Christmas and are looking forward to 2012. I got such lovely presents this year I feel quite overwhelmed. 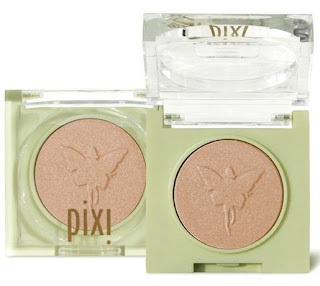 One of these presents I've wanted to try for a long time - Pixi's Fairy Light Solo in Champagne Glow. A beautiful golden flecked peach colour that brightens and lifts the eyes and is so nice to wear as a subtle but glamorous base on your eyes. Fragrance and paraban-free these shadows are suitable for even the most sensitive of eyes. 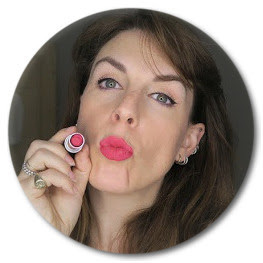 I'm addicted and have been wearing it ever since - I can't imagine a time when I won't want this colour in my kit and the shadow itself is so easy to use and highly pigmented that I want to get it in more colours - at £10.50 it is worth every penny.